Cohost Andrew Huff's haiku for the 105th edition of Tuesday Funk covered a wide range of emotions. This land was our land. This house used to be a home. no talk of a curse. A cat naps across my chest. a long but mild winter? A misty April evening greeted the live lit faithful on their journey to Tuesday Funk on April 4, 2017. Felix Jung set the mood with a collection of poems, then Melissa Wiley carried it forward with a short story about baking and desire. Tracy Harford-Porter closed out the first half with a story about sisters. 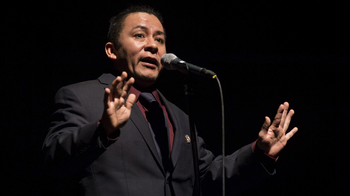 We took a quick break to refill our drinks, and Nestor Gomez told two fun stories -- one about finding his sports niche as a Guatemalan immigrant in a Chicago high school, the other about a flashback while putting a new stereo in his car. Cohost Andrew Huff read some topical haiku, and Kellye Howard read an essay about her existential struggles as a young mother. We'll be back in action on Tuesday, May 2 at Hopleaf, with readings from Mikki Kendall, Mary Anne Mohanraj, Anne Elizabeth Moore, Mare Swallow and Alicia Swiz. Please join us! Reminder: Tuesday Funk #104 is tonight! We're up to our ears in amazing readers this month! Don't miss Felix Jung, Tracy Harford-Porter, Melissa Wiley, Kellye Howard, and Nestor Gomez! Oh, and Eden Robins and Andrew Huff will also be there, if you're into that sort of thing. 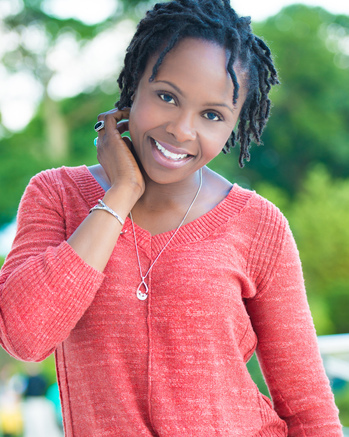 Kellye Howard is a writer, speaker, actress, and stand up comedian who has been featured on Comedy Central, TBS, NBC, FOX, WGN, and many more. 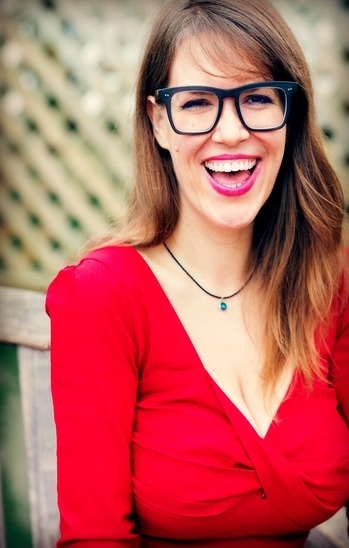 She also currently performs improv with Second City every Saturday night in the Blackout Cabaret. Please join Kellye and our other amazing readers on Tuesday, April 4, 2017 in the upstairs bar at Hopleaf. Doors open at 7pm, and the show starts at 7:30. It's free, and 21-and-over. RSVP on Facebook. 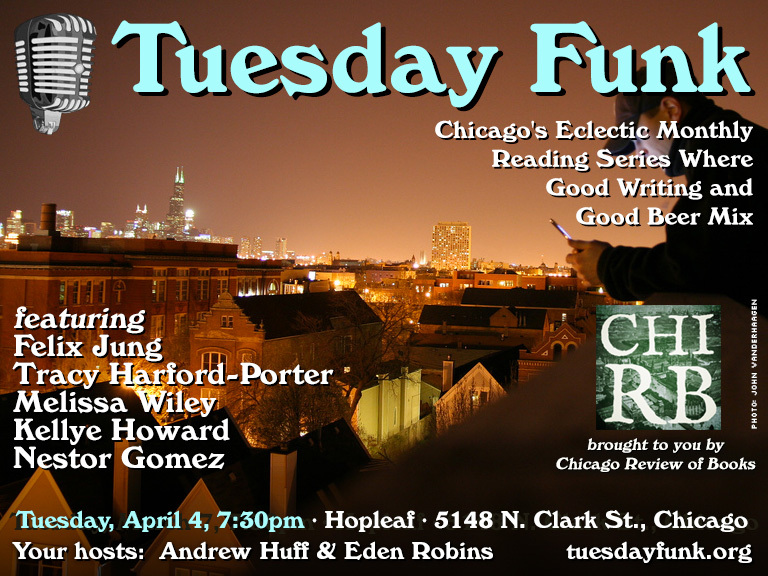 Please join Felix and our other amazing readers on Tuesday, April 4, 2017 in the upstairs bar at Hopleaf. Doors open at 7pm, and the show starts at 7:30. It's free, and 21-and-over. RSVP on Facebook. Melissa Wiley is the author of Antlers in Space and Other Common Phenomena, an essay collection published by Split Lip Press. Her creative nonfiction has appeared or is forthcoming in places like The Rumpus, DIAGRAM, The Offing, Juked, Noble / Gas Qtrly, Drunken Boat, PANK, and Queen Mob's Tea House. A freelance writer and editor, she is currently at work on a book about vestigial organs. She has a surprising amount to say about the appendix. Please join Melissa and our other amazing readers on Tuesday, April 4, 2017 in the upstairs bar at Hopleaf. Doors open at 7pm, and the show starts at 7:30. It's free, and 21-and-over. RSVP on Facebook. Nestor Gomez was born in Guatemala but has lived in Chicago since the mid-80's. He has shared several stories about driving for a ride-sharing company, which he used as material for his first solo show. 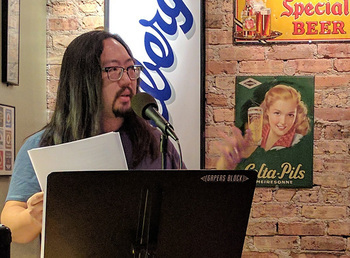 Nestor told his first story at a Chicago Moth Slam as a way to finally get over his stuttering, surprisingly he won that night and as of today holds the record for most Chicago Story Slam wins. However, if you ask him he will tell you that his biggest accomplishments are his kids, making his mother proud and winning the heart of his fiance Sweet Mel. 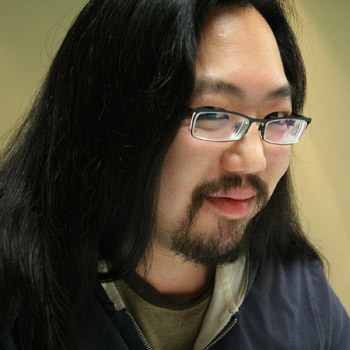 Find more about Nestor at Nestorgomezstoryteller.com. 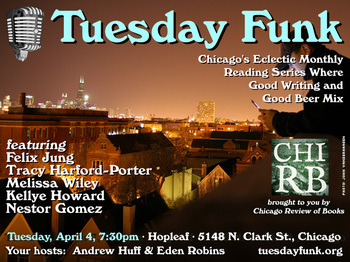 Please join Nestor and our other amazing readers on Tuesday, April 4, 2017 in the upstairs bar at Hopleaf. Doors open at 7pm, and the show starts at 7:30. It's free, and 21-and-over. RSVP on Facebook. Tracy Harford-Porter was born in Brooklyn, NY and now resides in the Chicago suburbs. 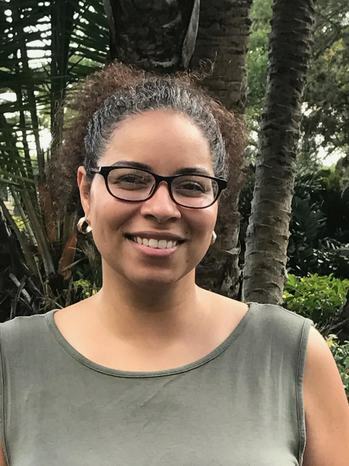 She has worked for Essence Communications as a photo editor, the Harlem Children's Zone as the managing editor of Harlem Overheard, StoryCorps as a facilitator coordinator, and Goldman Sachs as a long-term administrative temp/secret ethnographer. Tracy is a 2008 graduate of Clarion West and proud alum of Columbia University School of General Studies, majoring in anthropology. Tracy is thrilled to be sharing work with the Tuesday Funk crew, and would appreciate it if someone could direct her to a good Haitian restaurant. Please join Tracy and our other amazing readers on Tuesday, April 4, 2017 in the upstairs bar at Hopleaf. Doors open at 7pm, and the show starts at 7:30. It's free, and 21-and-over. RSVP on Facebook. Hello my friend, Let me tell you the story of Tuesday Funk #104. You see, there once was an eclectic monthly reading series, known in these parts as Tuesday Funk. It happens on the first Tuesday of every month in the upstairs bar at Hopleaf in Andersonville. Now it just so happened that April 4 was the first Tuesday of the month in April, and since the last show had been the hunnert-and-third, they figured they might as well call the next one number one-oh-four. Well, this here hunnert an' fourth Tuesday Funk is gonna feature some great readers. Sure, they got Felix Jung, Tracy Harford-Porter, Melissa Wiley, Kellye Howard and even Nestor Gomez. You'd be a fool to miss it. Doors open at 7pm -- don't come tryna get in early, they won't letchou in. The show'll start at 7:30pm sharp. You don't have to pay nuthin', but ya do have to be 21. Come by early or stay afterward for dinner or more drinks downstairs. RSVP on the Facebook, and if you want, become a fan of the Tuesday Funk page so's you can stay up to date on what's goin' on with the show. Sponsored by the Chicago Review of Books. This page is an archive of recent entries in the Reading #104 category. Reading #103 is the previous category. Reading #105 is the next category.